Year 1610 was a common year starting on Friday (link will display the full calendar) of the Gregorian calendar (or a common year starting on Monday  of the 10-day slower Julian calendar). March 12 – Swedish troops under Jacob de la Gardie take Moscow. May 14 – Francois Ravaillac assassinates Henry IV of France. 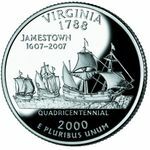 May 23 - Jamestown: Acting as temporary Governor, Thomas Gates, along with John Rolfe, Ralph Hamor, Sir George Somers, and other survivors from the Sea Venture (wrecked at Bermuda) arrive at Jamestown; they find 60 have survived the "starving time" (during winter): the fort palizadoes and gates are torn down, and empty houses have been used for firewood, in fear of attacks by natives outside the fort area. May 24 - Jamestown: The temporary Governor, Thomas Gates, issues The Divine, Moral, and Martial Laws. May 27 - Ravaillac is executed by being pulled apart by horses in the Place de Grève. June 7 - Jamestown: Temporary Governor Gates decides to abandon Jamestown. June 8 - Jamestown: Temporary Governor Gates' convoy meet the ships of Governor Thomas West ("Delaware") at Mulberry Island. June 10 - Jamestown: The convoy of temporary Governor Gates and the ships of Governor Lord De La Warr land at Jamestown. August 2 - Henry Hudson sails into what it is now known as Hudson Bay, thinking he had made it through the Northwest Passage and reached the Pacific Ocean. August 9 - Jamestown: The English launch a major attack on the Paspahegh village, capturing and executing the native queen and her children, burning houses and chopping down the corn fields: subsequent use of term "Paspahegh" in documents refers to their former territory. August 21 - Tuscans fight Turks. October 10 - Tuscans fight Turks again. October 17 - Coronation of Louis XIII of France. In Jamestown, Virginia, only 60 out of 500 settlers survive over winter. Arbella Stuart, pretender to the English throne, is imprisoned for marrying William Seymour. ^ "Calendar for year 1610 (Russia)" (full Julian calendar), Steffen Thorsen, Time and Date AS, 2007, webpage: Julian1610. This page uses content from the English language Wikipedia. The original content was at 1610. The list of authors can be seen in the page history. As with this Familypedia wiki, the content of Wikipedia is available under the Creative Commons License. 42 people were married in 1610. There were 0 military battles in 1610.